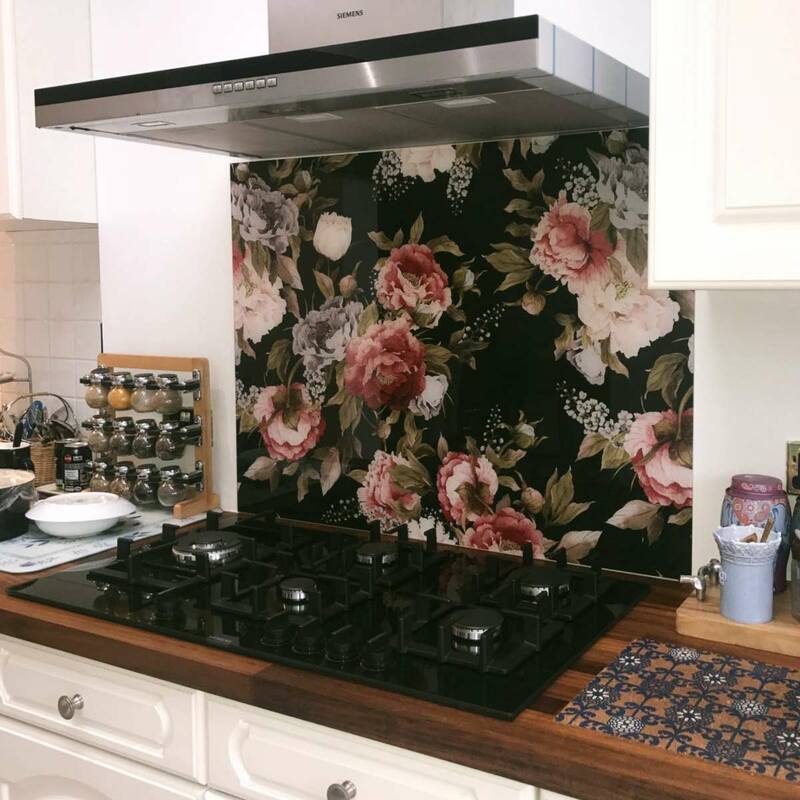 Splashback Reviews – How Did We Do by You? It really makes our day when we go over to our Facebook page or open up our email and you’ve shared pics of the spangly new products you bought from us. We don’t always get to see our modern glass splashbacks, wallpapers, Feature Tiles or vinyl flooring in their new homes, so when someone takes the time to share it gives the whole team a warm and fuzzy glow! During this month we’ve received a number of photos along with splashback reviews letting us know what you think. You’ve torn off the wrapping paper, had a good mooch at the shiny print and sparkly glass, and popped it in place as the finishing touch. Take a mo, breathe out and admire your new space. Oh, and just before the housewarming party invites go out, open up your computer and let us know how we did. Kisra sent us an email showing us her new kitchen and what a beaut it looks. A Big Thank-you for sharing Kisra! Over on our Facebook page, we were treated to a lovely post by Heather. Our Ila pattern looking absolutely stunning in Heather’s equally stunning new kitchen – just a big Wow all round! 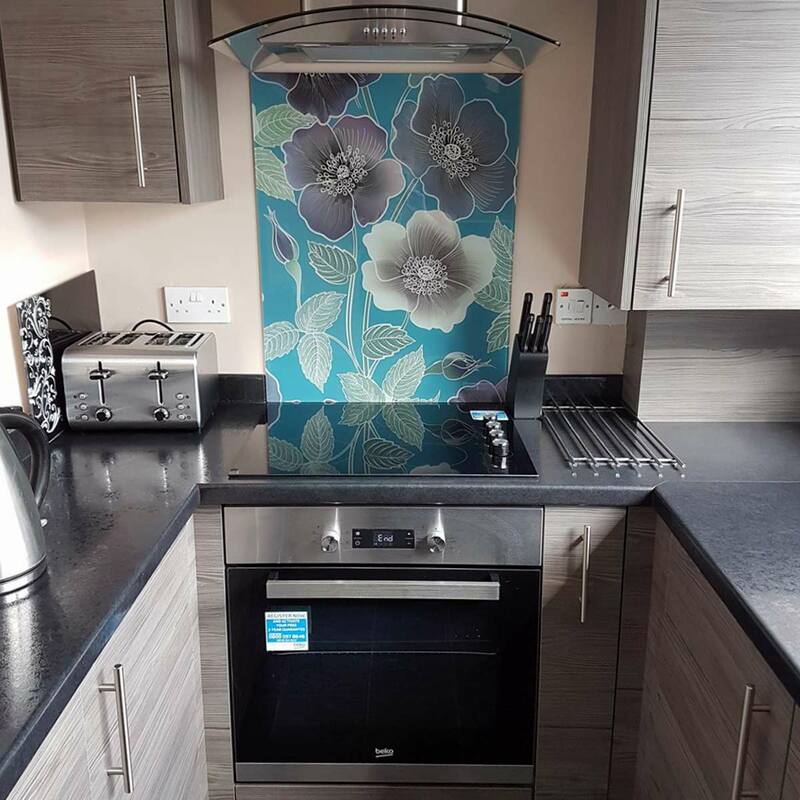 Heather told us she “loved this design from seeing it” and that it sets off her lovely new kitchen beautifully. I wholeheartedly agree – the room looks fabulous and I adore that colour combination of worktop and cupboards. Thank-you so much Heather for letting us into your home! Another one that appeared on our Facebook page was from Bernadette. 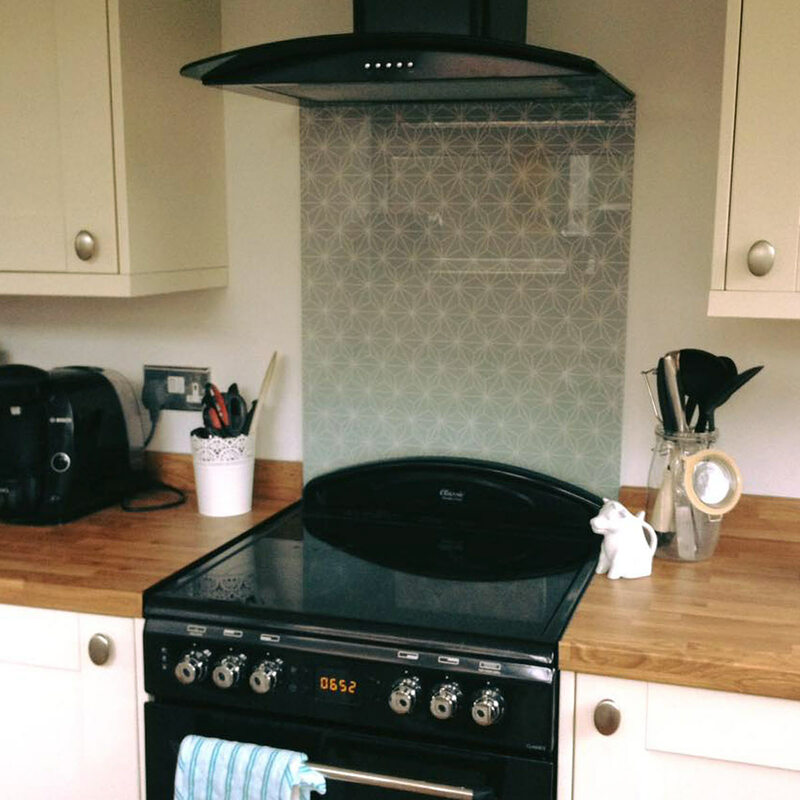 Bernadette picked our Austaar as a splashback for behind her oven and two Feature Tiles for behind her sink. The full review is over as a post on our page but we’re fairly sure Bernadette was chuffed with her purchase! In fact, looking at the time on the cooker’s clock, she couldn’t wait to share! Aww shucks! Heaps of thanks back over to you. Please don’t think we are only showing the positive. These are all the splashback reviews we’ve recently received. If we are sent anything less than top marks, rest assured, we will share. We want to make sure you have all the info and guidance before you choose where and how to improve your home. These changes can be big for you – we’re here to help. To finish off for now, one last note. It’s wonderful seeing these photos – the only problem is that they turn us totally green with envy! With reviews online at Trustspot, Facebook & Google, it really does help us to get noticed when you pop a little note on and tell us what your experience here was like. We’re doing all we can to build the company around outstanding customer service so any feedback is mucho appreciated. Thanks again to the ones who posted the above and we look forward to seeing many more! If you’re looking for splashback ideas, have a look at this post on some of our coloured splashback designs. We’re compiling a lookbook for interior inspiration 2018 (it includes wallpapers, flooring as well as more splashbacks) and we know you’ll fall in love with it! 5 Fresh & Crisp Home Interior Ideas For AW17 Home Decor Patterns That Spell Drama!